The NetLink Keyboard is a keyboard accessory for the Sega Saturn, and the North American equivalent to the Saturn Keyboard. NetLink keyboards, however, are black, and opt for a slightly different design. NetLink Keyboards were never sold separately, only as part of the Sega Saturn NetLink bundle (80120). 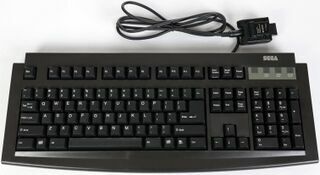 It is a standard PS/2 keyboard that plugs into the included NetLink Keyboard Adapter. It was designed primarily to work with software utilizing the NetLink Internet Modem and NetLink service.